Using a new computational method, an international collaboration has succeeded for the first time in systematically investigating magnetic quantum effects in the well-known 3-D pyrochlore Heisenberg model. The surprising finding: Physical quantum phases are formed only for small spin values. One of the leading models for studying 3-D frustrated quantum magnets is the Heisenberg model on a pyrochlore lattice—a simple cubic crystal structure (see illustration). Nevertheless, it has so far been extremely difficult to derive practical predictions, i.e. for specific materials and temperatures, from this theoretical model. "We were able to show that quantum physical effects surprisingly only occur over very limited parameter ranges", explains theoretical physicist Prof. Johannes Reuther from the HZB, co-author of the study. These quantum effects are most pronounced at the smallest possible spin (spin value ½). 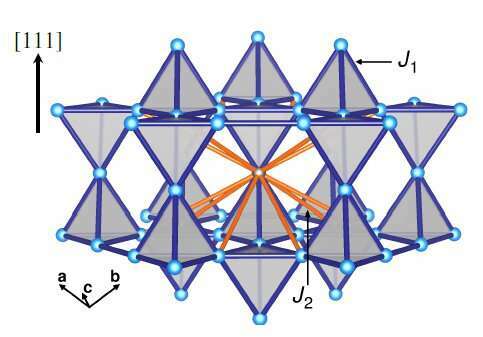 However, spin systems in the crystal structure investigated by the teams already behave almost completely like classical physical systems at spin values of 1.5 and above. The work published deepens our understanding of solids and contributes to the systematic advancement of the search for 3-D spin fluids in quantum materials.